Ronda Rousey is a very busy woman. She is not only a WWE Superstar, but she is also slated to be in the next season of Total Divas. Elimination Chamber was a good night for Rousey in theory, however, things didn’t really end up too well for her in a manner of speaking. Although Rousey did successfully defend her Raw Women’s Title against Ruby Riott, she eventually took a stray crutch to the head and was left busted open at the hands of Becky Lynch. Ronda Rousey will play the part of Sonya Blade, the iconic Mortal Kombat character in the upcoming animated reboot. 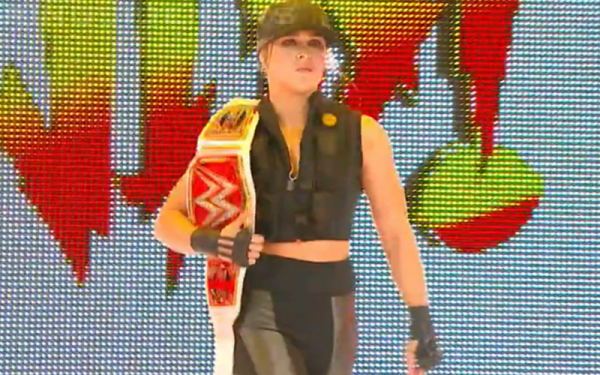 The Baddest Woman On The Planet showed up to Houston with the intention of paying homage to the Sonya Blade character and she did just that. The announce team made mention of this during her entrance which is a great tie-in to the video game franchise.